“Metropolitan Planning Organization” is the wonky name for an obscure but oh-so-important breed of public agency — the regional planning bodies charged with distributing federal transportation funds. MPOs can be powerful, transformative agencies that enhance economic growth, save people time, and improve public health. Or they can do the bare minimum required by law and continue to collect federal money year after year, merely serving as one more level of bureaucracy. Even worse, they can distribute funds in a way that hastens sprawl and urban decline. If you look at healthy, growing regions like Minneapolis and Salt Lake City, they tend to have more enlightened regional planning agencies. Still, there’s a lot of room for improvement. Many MPOs — and their close cousins, councils of government, or COGs — have been slow to adapt to the 21st century, with its new and more complicated set of transportation demands that extends far beyond highway construction. To help regional planners catch up on best practices, Transportation for America has released a new guide, The Innovative MPO. Here’s some of the sage advice inside. 1. Don’t limit the job to managing congestion. Federal laws actually specify that MPOs should address a broad range of goals, including safety, accessibility, and quality of life. Still, many MPOs have zeroed in on eliminating congestion, which isn’t even one of the eight factors the feds recommend focusing on. The problem is that addressing congestion, without a thought to how those decisions may lead to more sprawl and generate more traffic, can undermine other goals like improving public health. T4A recognized the MPOs in Chicago, Nashville, Portland, San Diego, Minneapolis, and Seattle for taking steps to ensure that planning efforts encompass public health, freight movement, safety, climate change prevention, and other goals besides moving cars. 2. How should your region grow? Show people their options! As the adage goes, the best transportation plan is a land use plan. Even the best transportation network will be overwhelmed if development is so spread out that everyone has to drive everywhere. But many MPOs continue to sidestep the importance of land use completely. One agency that’s getting it right is Sacramento’s MPO, which helped pioneer a technique called “scenario modeling.” By showing people the future effects of different land use scenarios, the MPO won support for a land use and transportation plan that forecasts a drop in motor vehicle traffic. Salt Lake City is another standout land-use and transportation modeling leader, reports T4A. 3. Concentrate investments in regionally important areas. Federal funding is drying up, and the recession has eaten away at other sources of infrastructure funds. MPOs that want to maximize their impact need to be strategic. Spreading money around “like peanut butter” isn’t the smartest approach, says T4A. 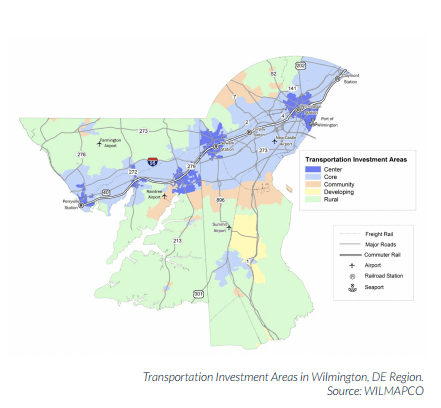 This approach prioritizes projects serving key, regional centers and attempts to coordinate housing and other development so more residents can live closer to work or find homes or jobs in walkable neighborhoods with access to public transportation. Albany, Atlanta, Austin, Denver, Philadelphia, Portland, Louisville, Seattle and Salt Lake City all use this approach to some extent. San Diego even uses financial incentives — $22 million in grants — to target development in walkable, transit accessible locations. 4. Don’t assume the future will be just like the past. For example, bad land use planning contributes to longer trips and more driving, but the cause and effect is lost in a simple evaluation of recent driving trends. But T4A warns against letting a handful of engineers decide what’s important to model. That is a discussion for the broader leadership of the organization. MPOs in Seattle, Dallas, San Francisco, and Phoenix have all done good work with more advanced modeling techniques, T4A reports. 5. Conduct meaningful public engagement. It can be difficult for MPOs to get the public involved because they represent such large areas, and few people understand what MPOs are and why they’re important. But that doesn’t mean MPOs can forgo public feedback, says T4A. A lot of MPOs simply conduct a “perfunctory” public engagement program that does little more than allow “a few people to vent frustrations, after which the same decisions are made.” That leads to worse outcomes. 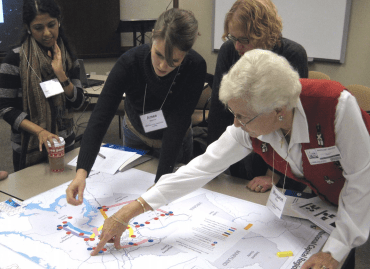 Many MPOs have started using role playing games to help make the public planning process more engaging. The District of Columbia’s MPO, for example, invites neighborhood activists with no specialty in transportation to provide feedback. Those participants then go back to their communities better informed about transportation issues. You can find many more suggestions about how not to be a terrible MPO in the full report. This is really great. I would like to understand more about the creation of the MPOs from the start and how did their role evolved to where they are today. The problems are often political. Suppose you have an urban center, where most of the jobs and traffic is. Neighboring cities have less regionally significant needs. Yet they pay taxes and demand that at least some of those taxes actually go back to those cities. This was the problem before ISTEA (1991), where one relatively affluent city could demand significant resources, while neighboring (often minority) communities were forced to let their infrastructure crumble, due to lack of funds. Am not knocking your solution, am just noting that is is complicated in ensuring how you meet the needs of ALL residents. This is why it was traditional, back in the Middle Ages and before, for cities to charge tolls. The city with all the jobs and commerce didn’t allow freeloaders from outside their jurisdiction… they instead charged tolls at the city gate. This was necessary because the national governments back in the Middle Ages were not allocating resources in any sort of sane way. If we continue to have a poor allocation of resources from the higher levels of government, the cities with the jobs and commerce will eventually start doing this again. How — and When — Can D.C. Help Local Transport Reform Happen?